What: “The Flight of the Garuda,” by the great Tibetan Yogi, Shabkar. Where: Chenrezig Tibetan Buddhist Center of Philadelphia, 9th and Spring Garden Streets (entrance on Percy Street). Offerings: The dharma cannot be sold or have a price put on it. Therefore, in accordance with Tibetan custom, there is no “door fee” for these teachings. Rather, it is appropriate to make an offering based on what you can manage. No one will be turned away for lack of money. Think of it as “sliding scale”. If you are unsure how much is appropriate to offer the teacher, a reasonable rule of thumb is roughly the amount you earn in one hour for each hour of teachings. Traditionally, white scarves (katak) are used to wrap offerings for presentation to the lama at the end of the teachings. Your offerings can be presented in envelopes which will be available at the door. Also due to changes in banking regulations, if you are offering checks, you are asked to please leave the “pay to” field of the check BLANK so someone on Lama Lena’s clerical staff can handle the paperwork. Thank you. Participants may make a separate offering to our center if they wish, to help with our expenses, it is entirely discretionary, our donation box is on the table by the front door. Live Webcast: We will be webcasting these teachings. Regarding an offering for the webcasts, you may mail a check to be offered to the Lama (our mailing address is at the bottom of the page), or you may do this through our paypal link, or if you would like to make arrangements in advance to have a kata or other offering presented to the Lama, we can work this out in advance, too. As with the live participants, please note that offerings to the Lama, and to the center, need to be made separately. For Paypal offerings, please note with the payment for whom (TBC, Lama Lena) the offering is being made. If you are participating by webcast, we do ask that you let us know in advance, especially if any arrangements need to be made. Thanks for your understanding. About Lama Lena: Over her nearly 40 years of dharma study and practice in this lifetime, Lama Lena spent three years studying with Lama Thubten Yeshe at his monastery in Nepal, and seven years in retreat and practice in a small cave above TsoPema (home of the Holy Caves of Guru Rinpoche) under the tutelage of her root teacher, Ven. Wangdor Rimpoche. For the past 25 years she has traveled extensive with Wangdor Rimpoche as his translator and assistant. In 2005, she returned to Tso Pema to assist Wangdor Rimpoche. She currently lives on the mountain above Lotus Lake with her two kandros. When she is not traveling, teaching or translating, she works providing medical assistance to the Tibetan refugee community as well as the local Indian villagers and mountain tribespeople. At the request of H.E., Zigar Choktrul Rimpoche and Ven.Wangdor Rinpoche – as well as many Western and Tibetan dharma students – she has been traveling and teaching from the lineages she holds in an informal style that is humorous, artful, and well worth experiencing. For other questions (or answers) and further information about these teachings, please contact Tony Boris (tonyboris@gmail.com) or see below to contact Lama Lena directly. For more information generally about Lama Lena’s travel and scheduling, please refer to the calendar section of the web site: http://www.customjuju.com/wangdorrimpoche/calendar.htm for up-to-date information, including contact phone numbers, directions, etc. “For the yogin who realizes the indivisibility of phenomena and emptiness like a rainbow in the sky or the reflection of the moon in water, , every experience of samsara and nirvana is a play of magical illusion. Watching the play of indivisible appearances and emptiness, the yogin whose intellect and mental processes are still, is content. Offered as a natural successor to Lama Lena’s teaching at our center last summer, Tsig Sum Ne Deb, “Three Words that Strike to the Heart of the Matter,” by Garab Dorje with Commentary by Patrul Rinpoche, this year, Lama Lena will share with us her extensive practice, insight and wisdom guiding us on an experiential journey within using Shabkar’s ‘Flight of the Garuda’ as the map for finding our inner unity of the ‘One Taste’ of awakened awareness. 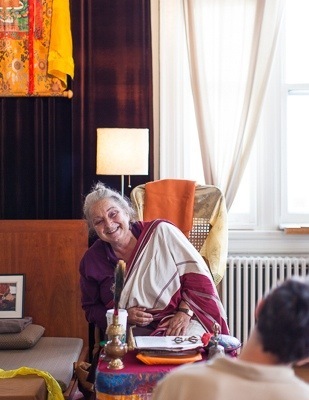 This teaching is open and suitable for meditation practicioners, both new and advanced in practice, entering with “beginners mind.” ‘This is a rare opportunity to receive teachings from the Heart of Dzogchen, the Great Perfection Tradition of Tibetan Buddhism. Shabkar lived during the 19th century and was a great eccentric wandering yogi who engaged himself in extensive retreat through the methods of direct awakening found in the Dzogchen tradition. His poetic song, Flight of the Garuda, contains the essence of his realization and insight and conveys the depths and heart of its practice. By Kalmyk Brotherhood Society in News on September 22, 2013 .